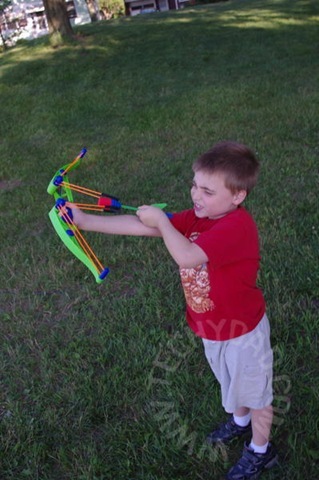 Since the bow and arrow set says it launches over 100 feet, I thought it wise not to try these out in our front yard. Even though the darts are made of a soft foam, which probably wouldn’t even hurt if they scored a direct hit on a person, I thought it wise not to take a chance damaging one of our neighbor’s cars. 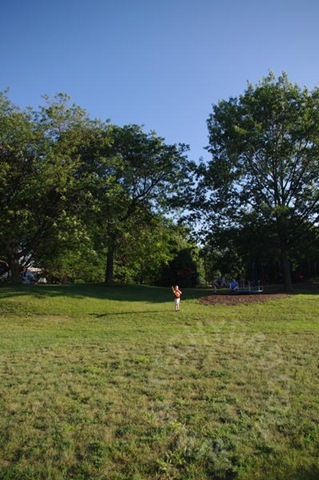 So off to a local park we went. Now, my boys are 7 years old ( almost 8 ) and 4. The package said that these toys were meant for ages 8 and up. 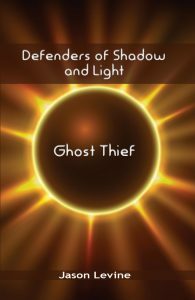 I figured that JSL would have a lot of trouble with them. Sure enough, he did. 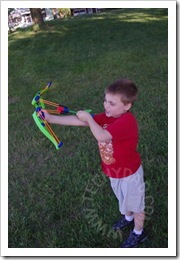 With my guidance, he was able to shoot off a few arrows. I didn’t measure how far these went, but they were a good distance. Maybe 20 feet. Not bad for his first bow shot! NHL had a bit of trouble at first, but adapted quickly. 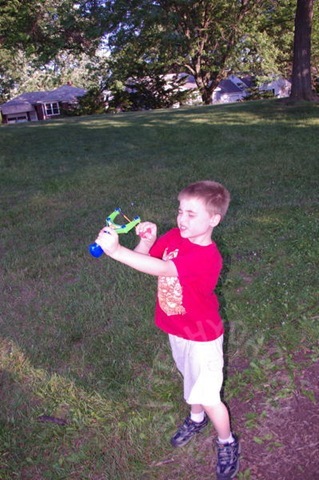 Before long, he was shooting arrows quite far away. 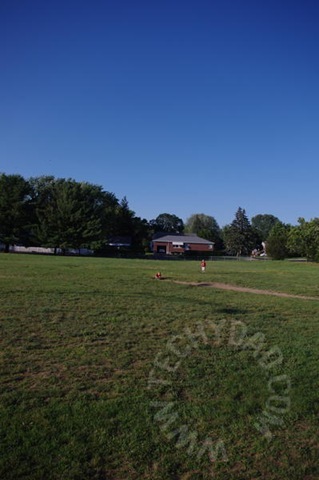 I don’t know if they landed 100 feet away, but they were pretty far. Then it was my turn. I liked that the arrows fit into a “quiver” that could be attached to a belt loop or other strap. This helped keep them in place when they weren’t flying through the air. The arrows have hooks on them that grip the bow’s rubber bands. Pulling back, I let the arrow fly. Sure enough, the arrows went extremely far. 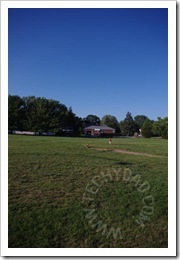 I didn’t measure, but it just might have been 100 feet. 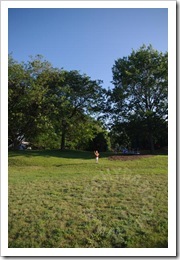 As NHL and JSL took turns running after it, the arrow’s red tip really helped us locate the arrows on the green grass. Next up was the slingshot. 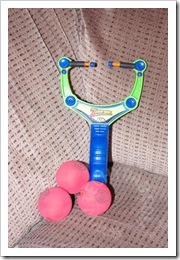 Unlike the bow and arrow, this had a ball that gets positioned between two stretching prongs. You pull the ball back and let it fly. Theoretically, it then shoots over 50 feet. Practically, the ball kept twisting and getting caught on the prongs. These misfires only went a few feet. We did get a few good shots out of it, but it was definitely the harder of the two to properly fire. Both the Zing-Shot Launcher and the Z-Curve Bow were a lot of fun. It didn’t take long for our toys to catch the notice of other children on the playground. They asked to try and before long there was a veritable line of kids waiting to try them out. 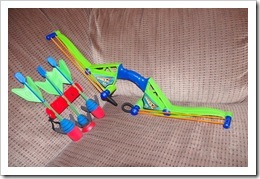 Of the two, I would definitely recommend the bow and arrow over the slingshot. It was easier to work and launched much further. 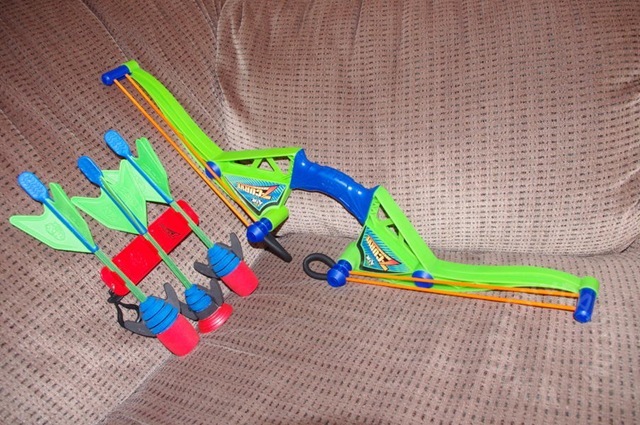 Plus, the “quiver” helps keep the arrows in place while the slingshot’s balls don’t have any receptacle to keep them in. 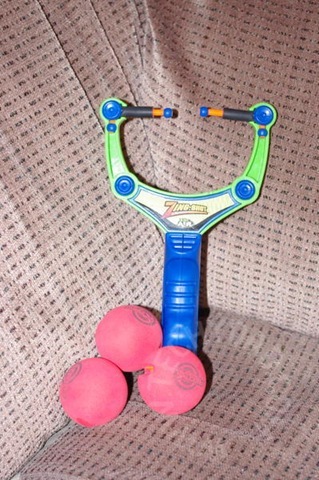 Either way, both toys were a lot of fun and both of the boys have begged to use them again. 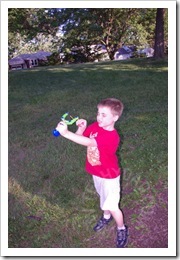 Disclaimer: I received the Zing-Shot Launcher and the Z-Curve Bow from ZING Toys to review. However, the opinions expressed above are my own.